Today instead of doing an after-action report like I was planning on, I'm instead going to talk about "Turn 0" otherwise known as the "Setup" for the standard game. 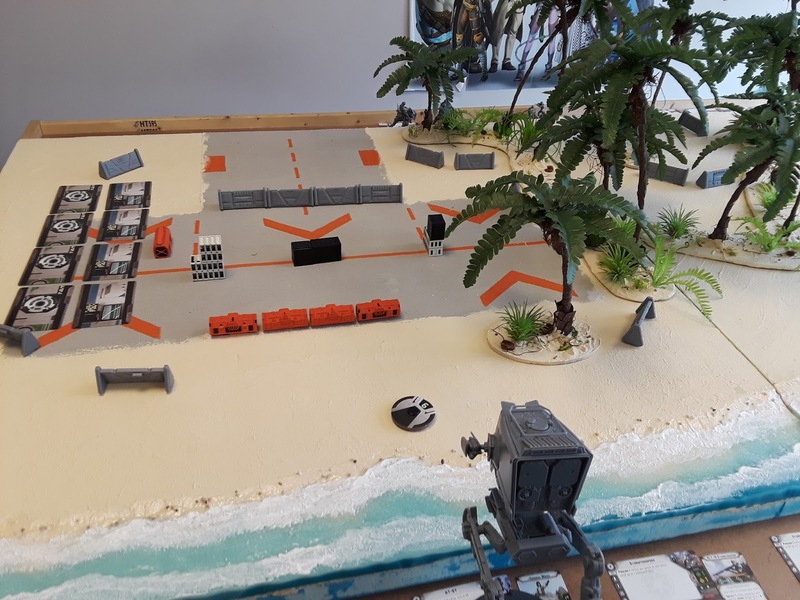 Special thanks for this article go to Jake's custom Scarif map, which he transported to Drawbridge Games on Sunday. Numbers 3, 4, 6, and 8 are the points at which choice is included in the game for setup. This is where you can make or break your game. Of these, the one you need to think of FIRST is #4, as this is one will determine how you should approach #3. 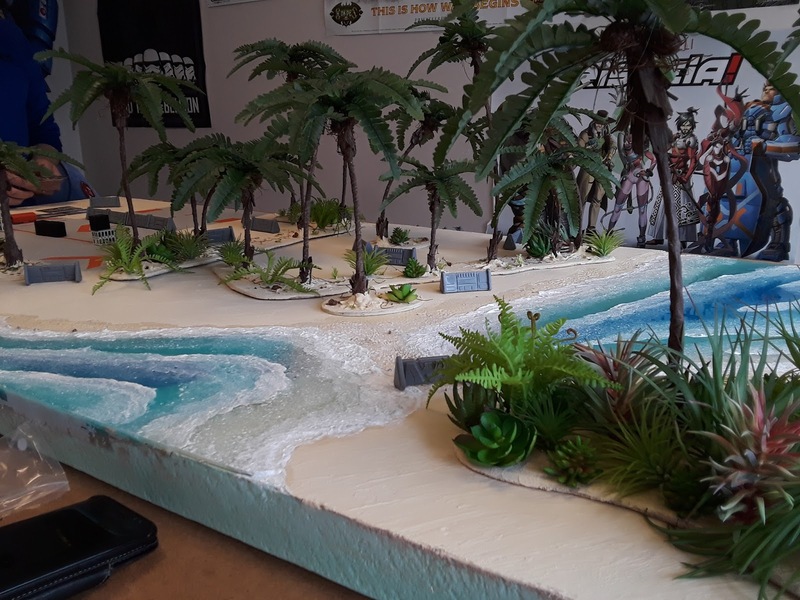 Please note, this entire section presupposes that the players will be playing with the Competitive Terrain rules on Page 9 of the Rules Reference Guide. It is much better if you're playing casually to agree on terrain placement and try to build a balanced map for everyone involved. 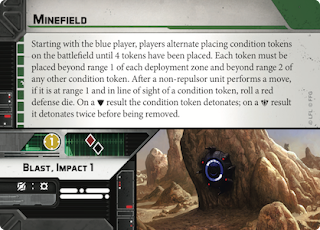 As of writing this article, there are 4 deployment cards, 4 condition cards, and 4 objective cards, with 1 more of each in the Priority Supplies battlefield expansion. 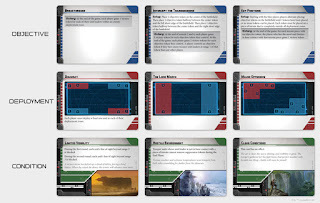 We can kinda forget about the condition and objective cards for a moment, and focus only on the deployment cards. Blue player will in 4 of 5 deployment cards have deployment in the Right corner of his side of the board (6" x 1'6") So, consider as you set up obstacles who will be able to choose Blue player. 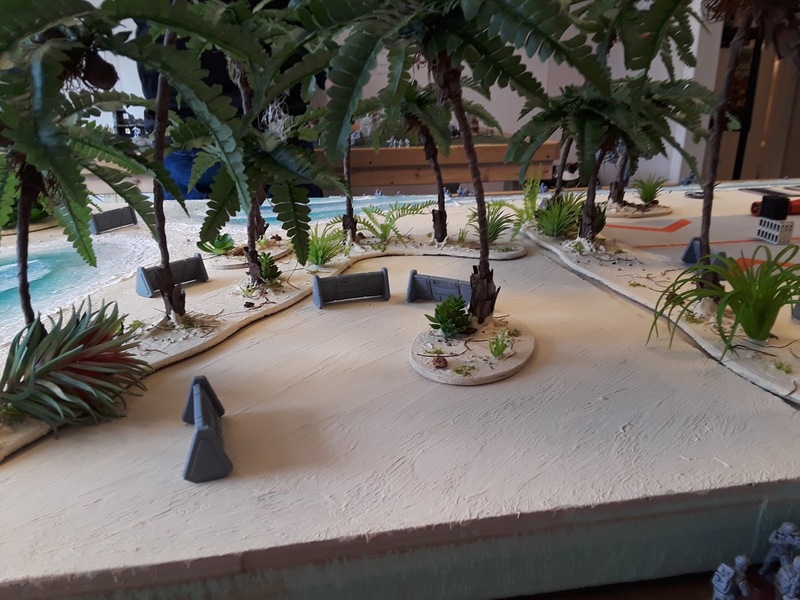 If it is you, your incentive is to set up terrain to let you expand out from your right corner towards the objectives, while as the player without a choice your goal is to keep things roughly equal so that there isn't an incentive to chose one side of the board over the other. Prioritize terrain that gives heavy cover as you approach the middle (the most likely place for objectives) and doesn't restrict your movement so you can push for that middle as quickly as possible. 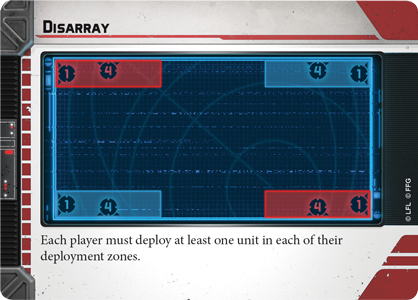 Disarray is the only deployment card so far that screws the whole thing up, pushing Blue out of "their corner" and giving it to Red, along with Red's corner. All other setup cards, including the one not yet released (Advanced Positions) give Blue the Right corner within their deployment area. 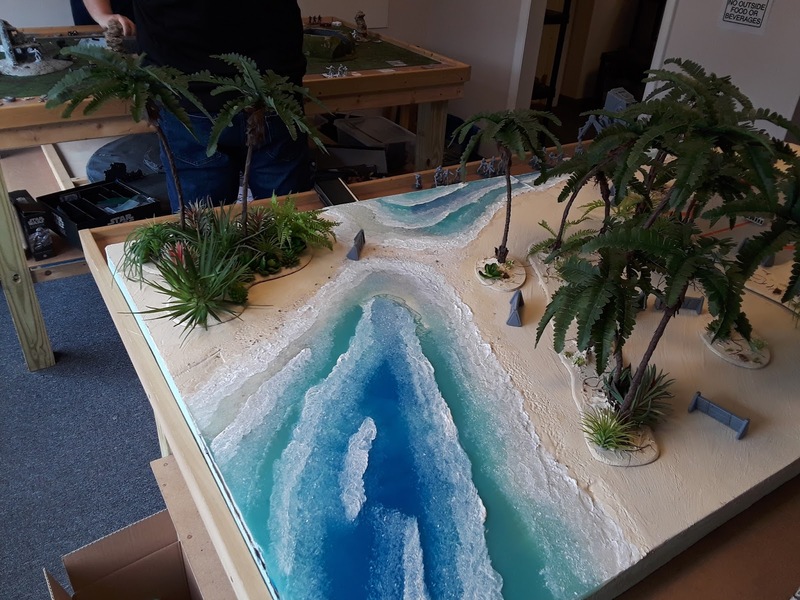 Take this board for example, there is some terrain already in place (shallow water) that already creates a natural choke point coming out of one of the two corners. 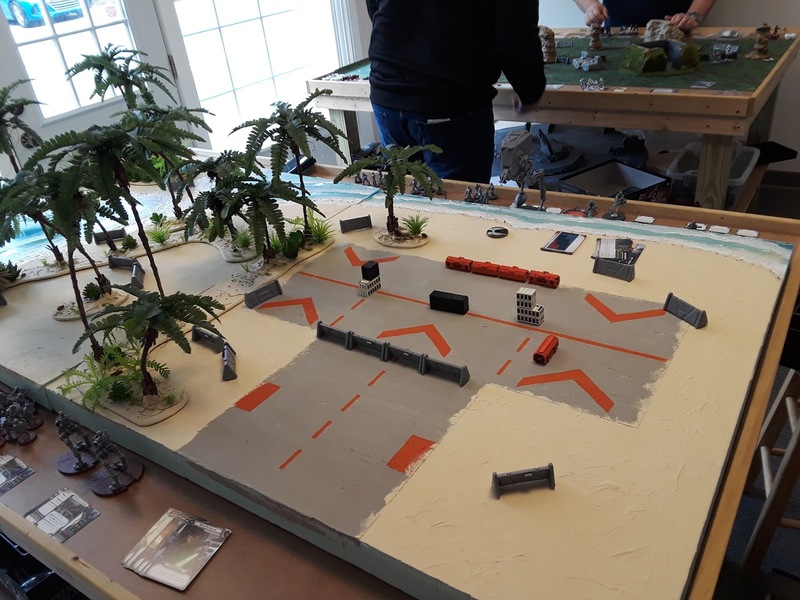 It would be difficult to place any further terrain on the water, so our obstacles got placed to have a fight in the middle of the board, as well as the "landing pad" on the other corner. This board will greatly favor a Blue player in most deployments who will choose the side away from the water. Once again though, disarray will put Blue pretty much directly into the water for most of one of their deployments. So you didn't build your list with any points left behind. Great! You can ignore this section, until you run into someone else that didn't and win the roll off. If you do get to decide, we've already said that you should be building "Blue Corner" out, but if both sides are roughly equal in terms of balance, you might consider going "Red Player" to get the final pick of Battlefield cards. Things to remember: You can always pass, and you get two selections alternating, with Blue player going first. With 2 selections, you can guarantee that you can clear out one row of cards, all the way to the rightmost card, and as Red player you get the final selection, being able to clear a card or pass depending on the state of the cards. Here we need to think about what cards help which players, and how much. Some intrinsically benefit certain players, but others will benefit based more on the board state than others. Some other cards work well with other cards, while others don't. Battle Lines - This setup most benefits the player able to bring their strength to bear on the biggest area at once. The line of battle is going to be drawn roughly down the center of the table, 6' across. That's a lot of space to cover, and being able to roll up one side of the enemy and push in from the flank is big. Because your troops won't be nearby, if you've taken Battle Meditation or Comms this will help a lot with this setup. 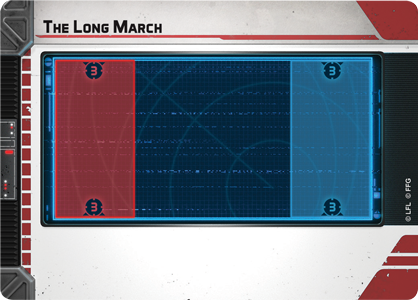 The Long March - This setup benefits someone who doesn't want to be flanked. The battle lines will be 3' long, giving the shortest possible space. Range 3 weapons that make it to the middle of the map can hit pretty much anyone on the front lines. Range 4 weapons anywhere near the middle can hit anyone as well. Initial turns will benefit long range combat, then things will quickly become close range. Also better for folks that did not take Comms or Meditation. Major Offensive - Probably the most neutral card, this benefits no specific army composition, and is the halfway point to both Battle Lines and Long March. Disarray - Assuming players set things up for starting in their respective corners, this is a strong Red Player setup card. Red gets both the "good" corners and leaves Blue with the worse ones. Obviously some terrain setups will make this better for Red than others. This also benefits lists with multiple commanders, or Luke / Vader with Battle Meditation. 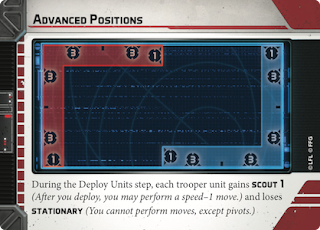 Advanced Positions - Scout 1 makes this one extra interesting, extending the effective deployment zone by a decent amount. This actually benefits big units the most, especially the AT-ST, which moves forward further with a similar speed maneuver to how quickly troopers move. Also benefiting is Vader, who loves any chance to get moving sooner. It's biggest benefit is to whoever has more deployments, and in that sense is slightly better for Red who deploys second. In terms of drawing battle lines, it's pretty much Major Offensive with a different skin. Breakthrough - Speed and maneuverability make or break this objective. Battle Lines make it easier to score, as there is the least distance to go (2') and widest area to maneuver, while The Long March is the worst because you've got the longest distance (3') and the shortest battle lines (also 3'). Does not benefit either Blue or Red player. 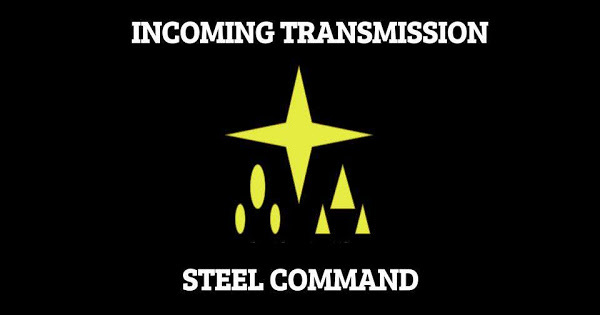 Intercept the Transmission - You don't control where the victory points go. Unless you are playing Battle Lines or Disarray, this is going to be a fight for the middle of the map, while holding the objective tokens on your side of the map. Late pushes are better, as you can score as many tokens in Round 6 as you can during the rest of the game. This also benefits the player who took lots of Troopers, as they are the only ones that can score this objective. Key Positions - Strong Blue Player advantage. 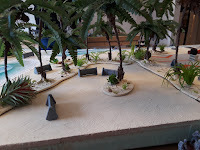 Blue Player gets to chose 2 of the 3 terrain pieces, and thus can select two near his deployment area and hold them (if he can) to win. Red is immediately placed into the situations where they have to go on the offensive early to shift Blue. Recover the Supplies - Neither side gets a major advantage, and the fight will most likely be over the middle of the field for the final token. More Troopers is better again, as Troopers are the only ones who can Claim a token. 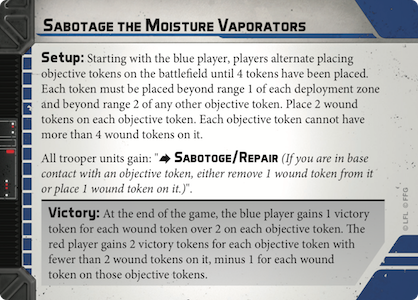 That being said, fast units that can flank and harass Troopers who already claimed tokens will also benefit from this objective. 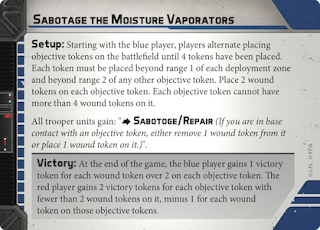 Sabotage the Moisture Vaporators - This one is similar to Breakthrough in that it doesn't really benefit either player explicitly. This won't be fought over the middle of the field though, it will instead be a scramble to score your own objectives, then push on your opponents objectives. Again, Troopers are king for scoring, as nothing else can. Neither color player can score more than 2 victory tokens per objective token, and while Red gets to play their token last, there's plenty of space for putting tokens down. Red may get the biggest advantage if they manage to get this AND Disarray. Clear Conditions - No benefit to anyone. Doesn't do anything. Cool. Hostile Environment - Benefits whoever has more cover. Also benefits (as opposed to most of the objectives) a player who has forgone trooper squads for Supports and Heavies. Limited Visibility - Benefits rushing troopers to the middle and double moves. Helps Rebels right now the most, as Imperials have the most access to Range 4+ weapons that can hit on initial turns. Double Move! Rapid Reinforcements - Set aside 2 trooper units and put them down in Round 2. This is a HUGE benefit for someone who has gone heavy into troopers, and for players who already have activation advantage. It can also indirectly help Red player if they don't have activation advantage, as Red can choose to not send any troopers into the reinforcements, after Blue sends (up to) 2 units. Potentially this gives Red a better initial deployment, which he then has until the end of Turn 2 to exploit. Minefield - This is a reversal of Blue Player advantage on certain objectives. Minefields let Red Player throw some traps onto the more plentiful Blue objective. To be fair though, it lets Blue Player throw some mines out as well. Repulsor Vehicles are exempt, so Speeder Bikes will do quite well with this objective. 1) Is there anything in the current slots that I absolutely do not want to play? Pick this immediately! 2) Is there anything in the third slot that I definately want to play? Pick the first one in that row. 1) Am I pushing for a 3rd slot that hasn't been cleared yet? Pick that one. 2) Is there something currently up that isn't good for me? Eliminate it. 3) Do I think my opponent is pushing for a 3rd slot card, and there's something in the 2nd slot of a different row that is really bad for them? If you are Red player on your final pick, consider what the best possible option you have is. Let's be honest here, this one is it's own article. Much like Armada, the game can be won or lost in deployment, making sure you have the right units matched up against the right enemies. This is definately something I'll have to tackle some other time, probably when we've all gotten a better sense of what each unit is capable of. That's pretty much it for today. We'll be covering the T-47 Airspeeder next in our Ground Commander's Guides, and hopefully breaking into the Imperials sometime soon after that!